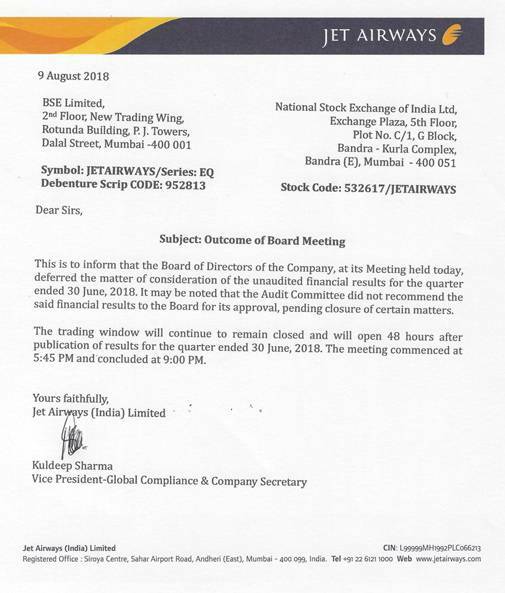 Jet Airways deferred announcing their June quarter numbers to an unspecified date. The development came after the company's AGM on Thursday. In a BSE filing late in the evening, the airline, which had its AGM earlier in the day, said the board of directors decided not to review the unaudited financial performance for the June quarter. Addressing the shareholders, Goyal said he felt "guilty and embarrassed" as shareholders have lost money, after airlines' shares plummeted due to the financial woes. The Jet counter slumped over 12 per cent since July 2 and in intra-day trading on Thursday, it touched a 52-week low of Rs 286.95. From its 52-week high of Rs 883.65 on January 5, 2018, the shares tumbled 67.5 per cent to hit a one-year low of Rs 286.95 in intra-day trading. Amid rising concerns over the airline's financial health and proposed salary cuts, he said a new committee will be set up to improve public perception and negative publicity about it. The official statement released on Thursday read, "This is to inform that the board of directors of the company, at its meeting held today, deferred the matter of consideration of the unaudited financial results for the quarter, ended 30 June, 2018. It may be noted that the Audit Committee did not recommend the said financial results to the board for its approval, pending closure of certain matters. The trading window will continue to remain closed and will open 48 hours after publication of results for the quarter ended 30 June, 2018. The meeting commenced at 5:45 pm and concluded at 9:00 pm."